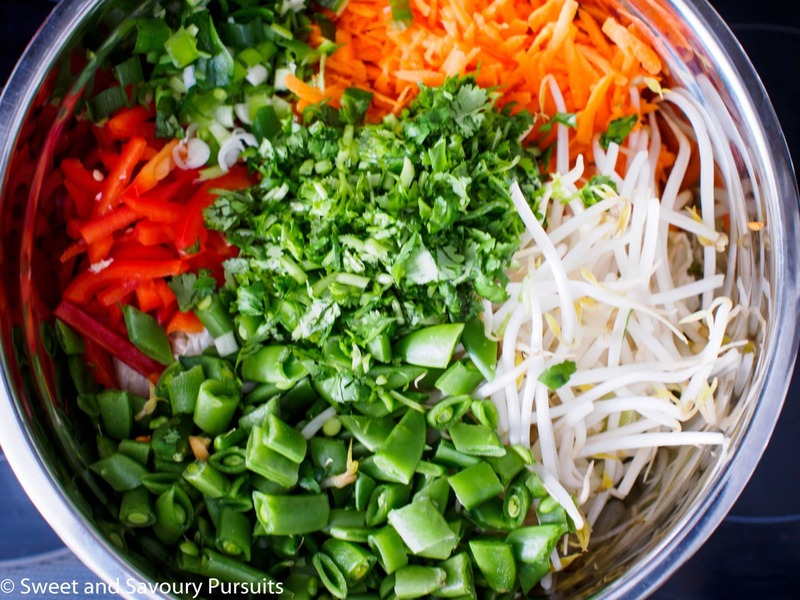 The combination of flavours and textures in this recipe will have you craving this Asian Salad with Peanut Butter Dressing full of crunchy and healthy vegetables! 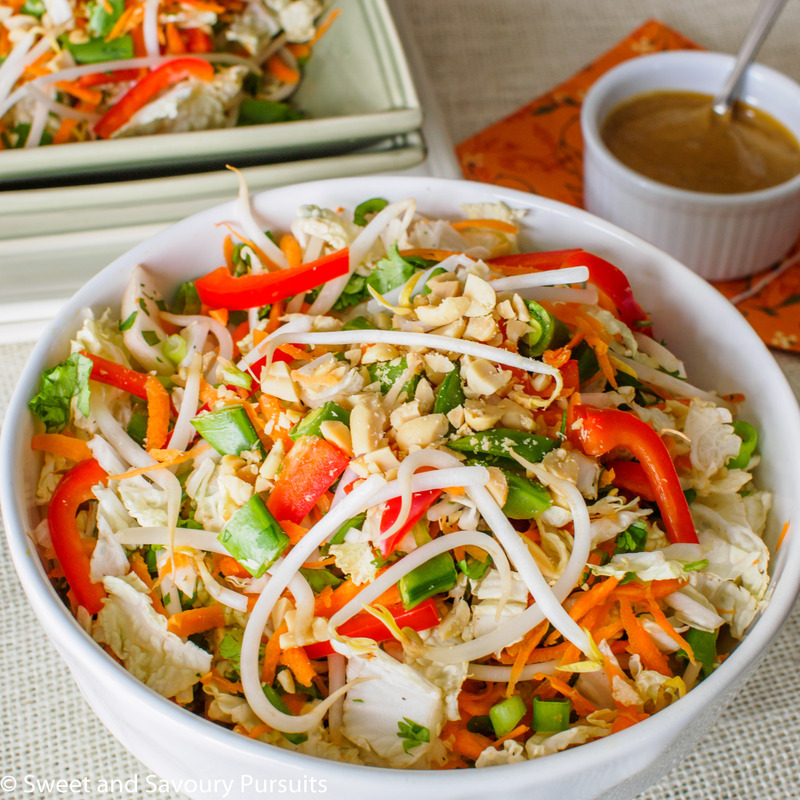 This Asian style salad with peanut butter dressing is so delicious and addictive, you’ll want to have this salad over and over again! This Asian Salad with Peanut Butter Dressing can be enjoyed as a light meal or you can add some protein like grilled chicken, shrimp or even tofu to make this a more substantial dish. There are many ingredients in this salad and although it takes a bit of time to prepare it, it does make a lot and will last a few days (without the dressing) in the refrigerator. Perfect for prepping healthy work lunches. The recipe makes quite a bit of peanut butter dressing, make sure to keep it refrigerated and it will last for days. If you love this peanut butter dressing as much as I do, make sure try it on top of these easy Chicken and Vegetable Lettuce Bundles. Combine and toss all of the washed and chopped vegetables in a large bowl. In the blender, add all of the dressing ingredients and blend until all ingredients are well blended and dressing is smooth. When ready to serve add desired amount of dressing on salad and toss. Note that you will need to thin out the dressing with a bit of water after it has been refrigerated. Just add a few drops of water at a time and mix well until you have the desired consistency. Looking lovely. What a great salad. Thanks for coming to moretimeatthetable.com! Thank you. It was my pleasure, thanks for stopping by SSP! I can literally taste this! This salad looks absolutely amazing! We are going to try to eat lots of veggies this summer, and this looks like a recipe we might be trying soon. Thanks so much for sharing! Thanks! It’s my pleasure, let me know if you do end up trying it. Your salad looks very fresh and flavorful! I love the peanut butter dressing, too. This looks lovely, so vibrant and colourful! Yesterday I had a salad with peanut butter dressing…. I ate until the last drop of that amazing dressing. I’ve never made it by myself, I’m going to try, thanks for the recipe! The peanut butter dressing is easy to make, I just put everything in the blender. This recipe makes quite a bit of dressing so you will have plenty to store in the refrigerator. The only thing I found is that I had to thin it out with a bit of water when I came to use it the next day. I hope you like the dressing! My kind of salad, light and packed with all that peanuty goodness. Your salad is gorgeous with all those colors and it looks like it has a ton of crunch too. Delicious! Thank you so much Ngan! Thank you, it’s my favourite part of the salad!